Plot synopsis: A nursery in a fully automated house allows its owners' children to create any virtual environment they desire, but when they use it to recreate the African savannah, the line between illusion and reality starts to become blurred. Based on a short story, originally titled 'The World the Children Made', first published in The Saturday Evening Post, on 23 September 1950; and later, as 'The Veldt', in Ray Bradbury's short-story collection The Illustrated Man, in 1951. Plot synopsis: In a future in which women rule the Earth and war has created a severe shortage of men, a spaceship containing three hundred women in search of husbands heads out to Venus to find them spouses. Based on a short story first published in Galaxy Science Fiction magazine, in July 1951; and later in William Tenn's short-story collection The Square Root of Man, in 1968.
Review: A truly dire story, which has dated very badly. This is an episode that is almost embarrassing to listen to, so crude is its 'satirical' take on gender politics. Its depiction of a matriarchal future society is laughably unsophisticated, with its underlying message seeming to be that all a supposedly liberated woman actually wants is a 'real' man to teach her her proper place. Even for those who might agree with this less than enlightened perspective, a fundamental problem with the episode is that the exemplar of a real man it presents us with is an oafish jerk, given to spouting charmless sentences such as the one I quote above. His idea of a marriage proposal - to a woman he has literally only just met - is to point out how much land he owns, and then plant a kiss on her so that they 'can try each other for taste'. Naturally, the woman refuses, until she is basically manipulated into agreeing to the arrangement - making this not only quite a tedious, but also a somewhat objectionable tale. One to avoid. Plot synopsis: A ruthless businessman determines to become the first man in space, and devotes all of his company's resources to achieving his objective. Based on a short story, 'Vital Factor', first published in Esquire magazine, in August 1951; and later in Nelson Bond's short-story collection No Time Like the Future, in 1954.
Review: Meet the boss from hell in this story about the race to build the first spaceship capable of travelling to the stars. There are some great moments in this episode as the central character blusters and bullies his way to realizing his goal, revealing himself to be a thoroughly unpleasant individual. The story also addresses the question of what is the 'vital factor' in achieving success - hard-nosed qualities and attributes like wealth, power and drive, or softer ones like sentiment? The conflict between these provides the episode with its dramatic tension, as the listener wonders whether the protagonist's unwavering belief in the virtues of money and determination will ultimately buy him the success he craves. I am, though, slightly ambivalent about the ending - until the last few minutes, the story is essentially a straight drama, but the twist that then occurs makes it a more conventionally science-fiction one, and I wondered whether it might not have been better to stay grounded in reality right up until the conclusion. That said, the twist is a pretty good one, and many will doubtless enjoy it. A final point worth noting is that one of the episode's central conceits is the notion that space travel might be pioneered by private entrepreneurs, rather than governments, which perhaps seemed a real possibility before the first manned spaceflights occurred (some years after this story was written). 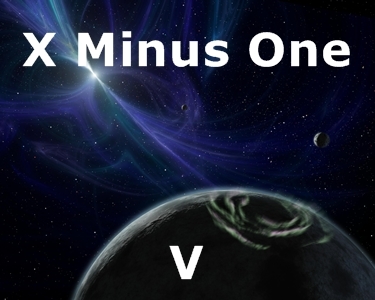 The same idea is explored in another X Minus One episode, Requiem, and it's interesting to compare the two, as the latter presents a much more sympathetic portrayal of capitalist enterprise. Plot synopsis: A scientist creates a race of intelligent flying creatures, with the intention of playing a joke on the world by having them pretend that they are not of this Earth. Based on a short story first published in Galaxy Science Fiction magazine, in May 1956; and later in Wyman Guin's short-story collection Living Way Out, in 1967.
Review: If X Minus One had one definite weakness in terms of the stories it selected for adaptation, it is probably that it chose to do too many (supposedly) humorous ones. Some of these episodes were very good - especially those based on stories by Robert Sheckley (such as The Seventh Victim) - but many were inconsequential and throwaway (see, for example, Open Warfare and A Thousand Dollars a Plate). This episode is one of the very weakest of these sort. I simply could not see the point of the story, humorous or otherwise. A scientist brings into existence a whole new species - as a joke? What kind of joke is that? Nothing in the story's execution is particularly funny, or especially interesting, either. The performances are fine, but the script is lightweight and insubstantial. What tops matters off is that the ending is simply ridiculous - and not in a good way.